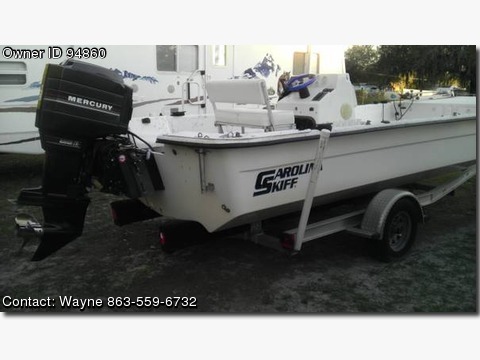 2004 238 Carolina Skiff, 135 Mercury 2.0L This motor has never been in salt water, Digital Salt Water series Motor Guide bow mount trolling motor Lowrance fish finder. This is the perfect fishing boat and motor in great condition. No wood to rot ever. Aluminum Magic Tilt Trailer also in great condition. A 23' open center console, this boat is light enough to be handled by one person and big enough for 10. It has an extreme low draft for the skinny back water flats fishing and a semi V for perfect handling or load up the family for a day of fun. This is a fun Boat that is fuel efficient and easy to pull. Contact# 863-559-6732 if I don't answer please leave message I will return call asap.